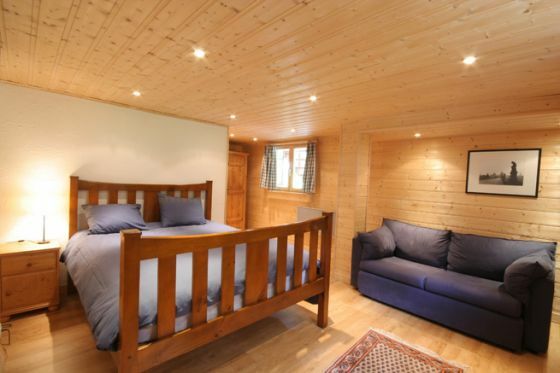 Chalet Potter is a well appointed modern chalet spread over 3 floors and boasts all the convenience and creature comforts of a new property whilst maintaining the charm of a traditional chalet. 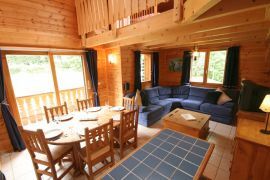 The chalet is situated in a peaceful and private location in a private garden next to some woodland, yet is only a 2 min drive to the nursery slopes in the village and to either of the 2 main ski stations of Les Houches. And the bustling town of Chamonix is also 5 minutes by car and easily accessible. 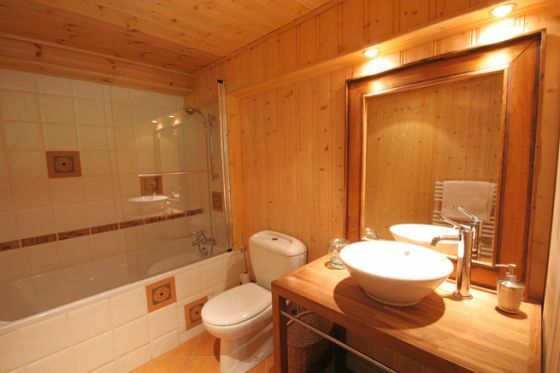 The entrance hall comprises a cloakroom, stairs up to the main living area, as well as access to the garage (which includes a washing machine) and a large double bedroom. 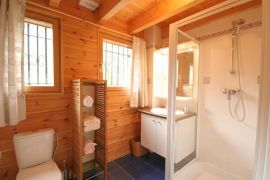 This spacious bedroom includes a sofa and large wardrobe as well as a stylish en-suite bathroom with shower, WC, wash basin and heated towel rail. French windows open on to the outside balcony with spectacular unobstructed views of the Aiguille du Midi and the Mont Blanc and access to the garden. The open plan living room has lots of natural light, a comfortable corner sofa farmhouse style dresser and coffee table. 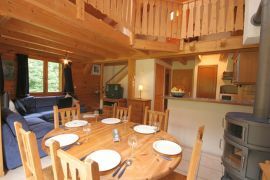 There is also a large extendable dining table to seat 8 with views of the Mont Blanc and a contemporary wood burning stove for cosy winter evenings. The open plan fully equipped kitchen, including fridge with a separate freezer, dishwasher, microwave, oven, hob, toaster etc. 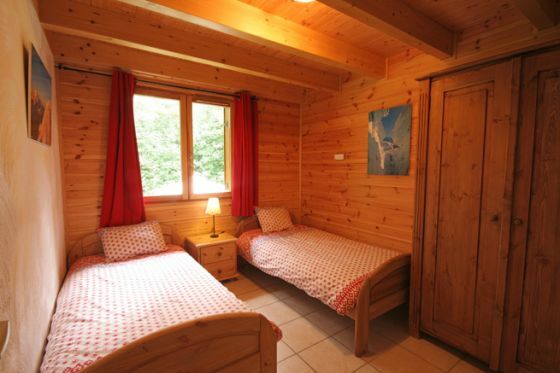 Also on the first floor is a comfortable twin room with large wardrobe and views of the forest. There is also a shower room, WC, washbasin with under floor heating and heated towel rail. On the technical side, the chalet also includes satellite TV (including British channels), DVD and HI-FI and free access to wireless broadband internet. 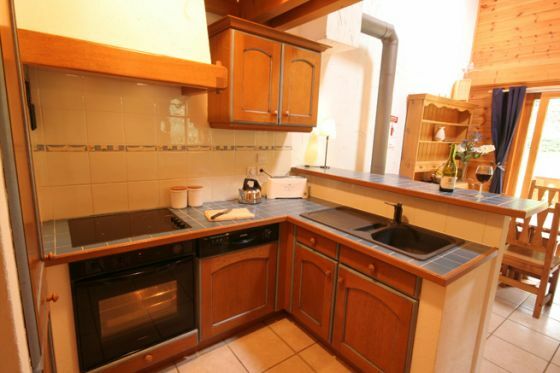 The top floor is dominated by a large balcony (child safe) overlooking the living and dining area. Off the balcony is a double bedroom, with en-suite WC, wash basin, and walk-in wardrobe. The balcony also gives access to the mezzanine area with twin beds and wardrobe. 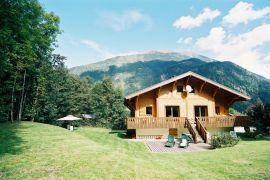 With breath-taking views of the Aiguille du Midi and the forests and glaciers reaching up to Mont Blanc, the garden also doubles as a great sledge run in winter. The large wooden terrace, complete with garden furniture, is ideal for dining al fresco in the summer. 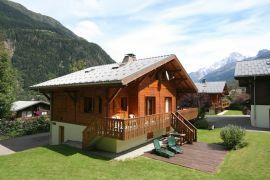 There are also sun lounges for those who like to put their feet up, with a Sun umbrella and a gas barbecue. Parking for two cars is directly outside the chalet on tarmac driveway.